Whenever any successful model is examined, a key ingredient that is evident is a well thought out, and well implemented plan! Models of excellence tend to blossom and thrive across all spectrums when goals are clearly articulated and constantly reinforced. In an attempt to provide insight in line with previous Bulletins, this month we will broadly explore why failing to plan, usually ends up in planning to fail. The contemporary environment that all businesses operate in is currently beset by uncertainty from all corners. To obtain clarity when no one can truly predict what is going to happen next socially, financially or politically, can and has rendered a number of business into a state of paralysis. Our belief at Archery Capital is that during these blurry conditions, businesses should actually review their plans, tweak if necessary and then stick to its implementation with driven determination. Grand Final Weekend finished recently, and if we look at the two teams that emerged victorious, it is evident what strong planning, and controlled implementation can achieve. It was not that long ago where both the Western Bulldogs and Cronulla Sharks were given no hope of taking home the silverware by any sports analyst given their respective challenges. However, the coaching team along with the players went back to the drawing board, planned, rebuilt, re-purposed, and came out guns blazing. These both teams epitomise this month’s theme of Planning around a vision and ensuring that all stakeholders are invested in it. They have, and deserve both our admiration and our heartiest of congratulations. Well done! The beginning of this month also saw the Big Bank’s CEOS front the first of the Parliamentary Hearings. What was evident to us at Archery Capital was that all the CEO’s came very well prepared, and no doubt utilised the full armoury of the resources available to them in each of their organisations. Clearly there would have been rehearsal sessions within the Executive levels in the Big 4 in anticipation of the Hearings where mock questions were thrown at them and detailed answers memorised. The gloves were up, and it appeared that they read their opponents quite well, because not one politician landed a critical blow. On the other side of this adversarial process, our assessment was that unlike the CEOs, the bulk of the politicians did not bother to genuinely respect the resilience and battle hardness of their opponents. There did not appear to be much planning around the anticipated points of attack. Regardless of whether they viewed the exercise cynically or not, the whole hearing appeared to fizzle. There were a few attempts to extract apologies and concessions out of the CEOs and their respective organisations. In our opinion, the ones given, were always willingly going to be given by the Banks before the first question was even asked. Had the politicians planned and acted with a bit more cohesion, as opposed to utilise the process for that potential opportunity to be the next soundbite in the ensuing news cycle, the hearings might have been more worthwhile, and achieved something. Instead, what most Small Business owners learnt was that a new Bank Tribunal would be established, and the banks were off until next year! Whatever your view on the banks, they fronted the Parliamentary Hearings willingly, and came prepared. It is not their fault that politicians failed in their attempt to further prosecute or defend the argument for a Royal Commission. For the Banks, it was a case of back to business as usual, with an added bonus of no longer having to donate to political parties! Welcome to the Big Chair! So what will actually stimulate the sluggish parts of the economy that we need to stimulate ‘Jobs and Growth’? We unfortunately do not believe that it is going to be coming from our elected leaders in government. Instead, as usual, this responsibility is going to fall to the business sector. As you prepare yourself for this task every day, our hope is that you not only set out, but that you also achieve your daily goals. If we can help finance any aspiration in this respect, we would be happy to discuss this with you. 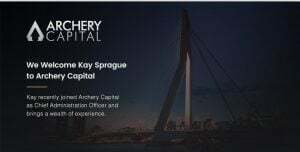 Archery Capital was approached by a Voluntary Administrator who was seeking to trade-on a business in order to preserve its value so that it could eventually be sold as a going concern. Unfortunately, none the main tier financiers were willing to lend to a company under Administration, despite the blue chip security on offer. 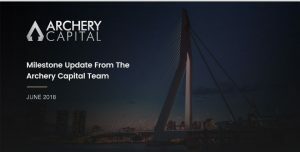 The Administrator was instead referred to us at Archery Capital, and we were able to assist the Administrator and the business by providing funding for the trade-on and anticipated eventual sale. All stakeholders were extremely happy with the outcome, particularly the owners and workers of the business in question. One of the biggest rewards that good planning and implementation reaps, is that your client base is acutely aware of it. The value of your product and the brand of your operation is enhanced by presenting a business that is truly in control of itself, which in turn promotes confidence. In the last month without us even taking the easy pot shot at politicians (Donald Trump anyone), it is evident how failing to plan and implement effectively damaged high profile operations that include the likes of behemoths like Samsung, the Australian Cricket Team and Masters. All of which carry cautionary tales of poor planning and execution. So as you meander you way through a complex minefield of political, economic and social headwinds, our hope is that you do so with a plan that is constantly being reviewed, reinforced and adhered to. If you require it, Archery Capital would love to be able to support you and your business in this respect. Finally, and as always, please feel free to contact us for a discussion on anything you believe we might be able to help you or your clients with.